How do you view the strikes that are commonplace today? There is a presumption among those who strike and those who are prone to strike that certain facilities have to be given free. And in the Sri Lankan culture, by way of political influence too, these ‘giving free’ mind sets have been inculcated among people. This outlook has become a wound more than a cure, making way for losses rather than betterments. However, the bitter truth is that nothing is free. There is always a cost to this so called free aspect and someone is bearing the burden. In the case of free healthcare and education, it is borne by the public by way of direct and indirect taxes. Free means that it is a right to be accessed by all citizens alike. The reason that something is free does not mean that it is a right or entitlement for a certain section of people or the less privileged. Why are we seeing all those connected to government decisions or government organisations displaying their resistance in the form of strikes? If strikes are all that can be done in opposition, why don’t we see private sector employees or stakeholders connected to them on strike? By the way, it cannot be assumed that the public who are in the private sector or nongovernment sector have zero or a negligible amount of dislike or that their mind sets are neutral. People are all alike and feel their fair share of disheartenment. As for the government related incidents of strikes, there is no penal code applicable. However, what is happening is that people in the private sector are held back by certain rules and offences more than ethics. This is one of the differences in terms of the people we see in common strikes today. This country has not embraced the true meaning of entitlement, rights and duties. Simply, democracy has been taken with quite a harmful outlook on how it should be. There is a school of thought that many free facilities that are provided are given as gifts. So these benefits have been taken for granted. People hardly value these benefits that they receive, which are provided with public funding given the fact that Sri Lanka still holds the status of a Third World country seven decades post-independence. Only the rights but not the duties! People are inclined to think about what they get and if they get it, they go ahead with their selfish agendas. Most of those who ask for free education are not willing to serve the country. They are the first to flee the country and never to return to provide a service for the free rights they received. Those in the healthcare and academic education sectors, once they leave for postgraduate studies will remain overseas. Like lizards that change their bodies’ colours, those who strike also put up multiple faces and agendas, changing from time to time. The failure of someone and suffering by someone. When people resort to strikes, onlookers may perceive them as raising demands to achieve a particular aim of theirs. However, on the other hand, these demonstrators are created, pushed and put on the road to raise placards and raise their voices against offences committed by the government in power. Perhaps these people have no option as the authorities pass the ball. As such, if they have been ignored or treated badly even for a trivial matter and their grievances are not properly addressed, a strike is a short-term fix. All in all, whatever the root cause may be, even as a democratic country, we cannot approve or give the green light to strikes of this nature. For it is not a sign of democracy in its true essence. A democratic state is in place to protect the rights of working people. There is no debate about it. Similarly, the public must have freedom of expression. There should also be freedom of speech. They were lost, and now, we have full freedom and rights. But the background behind this is unethical. Many strikes are farces. Some protests and rallies have been held challenging even the rule of law. The strikes caused massive losses and anguish to the public. The developed countries of the world have shown that there is no room for strikes in those countries. It does not mean that employees’ rights have been slashed. South Korea, Malaysia, Taiwan and Singapore have shown that the worker’s rights are well preserved. If trade unions continue to flare up, it is the responsibility of a government to take any decision in that regard. Otherwise, the institutions of the country will not survive. At the onset, it was initially thought that strikes were a part of voicing. But now, it has spread like a habit or as part of a lifestyle. Now, it seems like if you want to resist, just strike. Look at the disturbances that this creates. 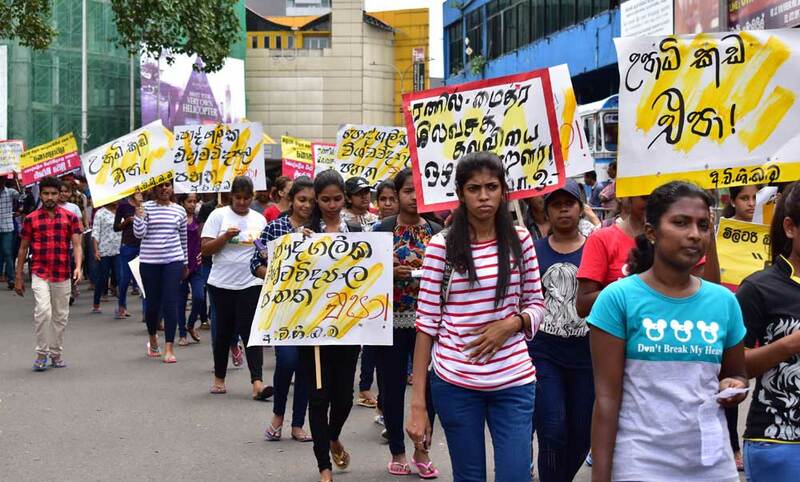 Most strikes take place in and around the city of Colombo on weekdays with certain places like Philip Gunawardena Grounds and Children’s Park and others being earmarked for these. Mostly, it is the public that is inconvenienced. Disruption to day-to-day life, uncertainty in service availability and increasing road congestion – without adequate mobility, the public can’t be helped even in an emergency. Therefore, this type of striking appears to be violent and ends with disruption. In fact, these strikes and protests have made the people in the country more aggressive than the government. This issue has been severely impacting the country’s economy. A decisive impact has also been achieved in limiting the country’s development path. Some strikes and agitation forced the public to rush for hours and on other occasions, the day-to-day activities of state and private institutions had to be curtailed by the protest campaign. These strikes, gimmicks and protest campaigns will no doubt have a direct bearing on the local tourism industry. There are many hotels in the city with agitation and protests – which are common in the city of Colombo – and the number of tourists arriving in the country will be reduced. It’s good that people are going to protest about their problems. When Maithripala Sirisena became the president, people were less afraid to protest. On the other hand, it is known that freedom should be in a democracy. Also, working people have the right to strike for their own rights. A trade union is forced to strike in a situation in which rulers do not listen to their demands. A trade union does not expect that its demands will be fully met. It is the responsibility of a trade union to accept the rulers if they give the maximum that they can give. It is unethical for a group of professionals who enjoy great privileges in society to continue to strike, threatening the lives of ordinary people who do not have privileges. Every profession has morality. In addition, we have allowed earnings from private channelling without limitations. It is antidemocratic if such a group continuously ignores the lives of poor and helpless patients and continues the exploitation of the poor. The freedom of association is a right that is enshrined in our constitution and the right to strike flows from the freedom of association. In recent times, with the citizens of our country enjoying unlimited freedom, resorting to strike action by different groups has become a popular tool. This will enable the affected groups to compel employers, administrators or the government to come to the negotiating table to grant relief to the affected groups. In some instances, groups have resorted to strike action in order to compel the government not to implement certain decisions. The question is whether resorting to strike action is always justifiable. My response is in the negative. In many instances, groups resort to strike action for frivolous reasons with ulterior motives, holding the public to ransom. It is evident that some of these strikes are politically motivated, and strikers take to the streets taking the law into their hands and run amok, causing damage to public property and causing untold hardship to the public. Therefore, in my view, the right to strike should be allowed only within permitted controls as excessive freedom leads to abuse. All local and foreign investments are halted due to strikes. Hence, the salary scopes demanded by the strikers are also tax burdens on the people. Hence, we need to call for salaries to support the development of the country, not the development of the employees. Trade union leaders use strike action to take advantage of it. Therefore, it would be good if the employees who come out with these people act wisely or this country will never advance in the future. The employees should understand that they are employed for a job and not be arrogant with their position. It is not the responsibility of employees or trade union leaders to be proud of their profession and persecute people. Now, Sri Lanka has made some progress in the world in its negative aspects. We are among the five countries that have gone wrong. If this situation continues, our future lies in a very uncertain situation. Therefore, civil organisations, trade unions, as well as employees should act on behalf of the country. We make accusations that we always endure the sufferings and the rulers are satisfied. But if we think a little, we will understand that we are the ones who appointed such rulers in parliament.